Back by popular demand, this seminar addresses the key practical issues arising from the use of digital communications technologies in automated manufacturing and advanced engineering applications. Covering the use of PROFIBUS and PROFINET in key application areas such as packaging, printing, electrical and electronics assembly, robotics, automotive engineering, drives, mechanical handling and logistics, control systems and energy management, it focuses on the practical aspects of using PROFIBUS and PROFINET in factory automation applications from system design and safety considerations through to maintenance and fault-finding. Supported by demonstrations of actual tools used in configuration and maintenance, the seminar is of great value to Designers, Production Engineers and System Engineers involved in design, operation and maintenance of modern automated factories and machinery. 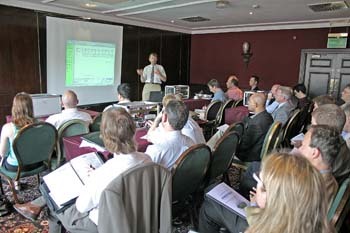 If you’d like to learn how to simplify your PROFIBUS automation application … don’t miss this one-day Seminar!